It can happen in any business meeting: Some unhappy employee asks a question that is off-topic, related only to their own situation, or to push another agenda. 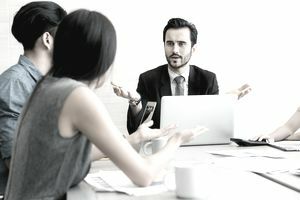 How you respond to disgruntled employees and challenging questions is important because it sends a message to other employees about the attitudes and philosophies held by management — even when those attitudes are not necessarily those of the company itself. The following strategies can help you respond appropriately to employees who try to stir up trouble in business meetings. If you devalue one employee, their peers may also feel devalued. For example, if you insult one assembly line worker, you insult them all. If you criticize one secretary, others are likely to also feel criticized. Even if you make carte blanche statements; "tech support failed to do their job but we are working on getting them up to speed" you devalue other employees' peers, friends, co-workers and send the silent message if management will publicly flog one person or department, they could flog yours, too. If someone asks a question that is hostile, unrelated, or inappropriate, direct the person asking the question with a specific command or instruction, such as to put it in writing to management so you have time to carefully consider the problem or idea later. You might be able to diffuse a particularly volatile question by including the person posing the question rather than excluding them. For example, you might suggest they come up with a brief meeting agenda on that topic or a list of concerns. Be sure to give them a specific person to submit it in writing to. If you do not offer a clear set of instructions, you sound dismissive. If you are not sure who the right point of contact is, say so, and ask the employee to call or email you later after you have had time to find out who they should really pose their question to. As soon as you give a meeting "air time" to, or spend too much time addressing one angry questioner, you may end up with others jumping on board due to the "crowd phenomenon." The crowd phenomenon describes when an individual who might not do or say something on their own feels empowered when others are doing something, joins in with whatever the others in a group or crowd are doing. In a meeting, if one person gets away with taking up time, others are likely to attempt to join in with their own agendas, concerns, or questions. Never make statements that devalue the person directly or indirectly. If you say a question is unfounded and deserves no reply, the message the audience might hear is that you are dismissing a concern they have. You can validate a persons' question without valuing it outside the other persons' feelings. Validation is simply an acknowledgment that something is important or has value to someone else — even if it does not to others. By incorporating statements like, "I understand why you think that is important," or "Clearly the situation was upsetting to you," is not the same thing as admitting you agree.